Bryan Singer's long-in-production war thriller is well acted and occasionally thrilling, but it ultimately suffers from Apollo 13 Syndrome and a few directorial flourishes aren't enough to lift it into greatness. 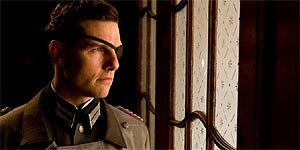 Directed by Bryan Singer, Valkyrie (pronounced VAL-ka-ree) is based on a true story and stars Tom Cruise as Colonel Claus von Stauffenberg, an injured Luftwaffe hero who joins forces with the German resistance (including Kenneth Branagh as Henning Von Tresckow, Bill Nighy as Friedrich Olbricht and Terence Stamp as Ludwig Beck) in 1943 and plots to assassinate Adolf Hitler (David Bamber) in his Wolf's Lair. The genius of the plot involves turning Hitler's own emergency plan (Operation Valkyrie) against him, using his standby troops (led by Thomas Kretschmann) to arrest the SS members, who will be framed for the plot. Despite the presence of swastikas and Nazi uniforms, there's no element of complexity to the characters here, with the resistance members all so anti-Hitler that they might as well be English. That said, the performances are largely excellent, with Cruise, Nighy, Kretschmann and Branagh all on top form – indeed, Branagh is so good that his loss is keenly felt once his character disappears. Singer orchestrates a handful of decent sequences (e.g. a devastating aerial attack early on), but his real strengths come in the smaller details, such as the sand slowly turning red with Stauffenberg's blood, the reveal that a church no longer has a roof or some effective scenes set in teletype offices as the orders come in. The film's biggest problem is that it suffers from a bad case of Apollo 13 Syndrome, in which all suspense is lost because the audience knows that the plot ultimately failed. It also has a couple of dodgy performances (step forward, Eddie Izzard) and some of the actors (Bernard Hill, Izzard) clearly didn't get the memo about losing the Germanic accent. Valkyrie is a watchable thriller that tells a fascinating story, but it's never as suspenseful, as exciting or as morally complex as it should have been.